OXO is a company founded on the principles of universal design where thoughtfulness and attention to detail are the norm. When working on their products my process reflected this with a commitment to exploration, testing, and refinement. I learned to find the “ah-hah” moments that can set even the simplest products apart from the rest. With this project I was asked to create an ethylene absorbing refrigerator accessory as part of OXO’s new GreenSaver line. Place this where you keep your fruits and vegetables and let it absorb the gases that prematurely rot produce. In this phase we generated ideas around different functional concepts and product architectures. In our group brainstorms, we tackled questions like how filters get replaced, where/how the device is installed, and how to optimize air circulation. Early concepts were then built into sketch models to quickly get the ideas off paper and into users' hands for feedback. I was interested in whether the concept's form conveyed it's functions and which were most valuable. With the product architecture and main functions nailed down, I worked to refine the form and other details such as a way for keeping track of when the filter needs changing and how the two parts of the body separate. With these models I wanted to look at where the product will live in the refrigerator and how it will be used. Sleek and flat for attaching to a wall or under a shelf. A sphere shape to put where most of your produce is. Triangle shaped to tuck away in the corner or maybe a wider base to make space for more airflow. 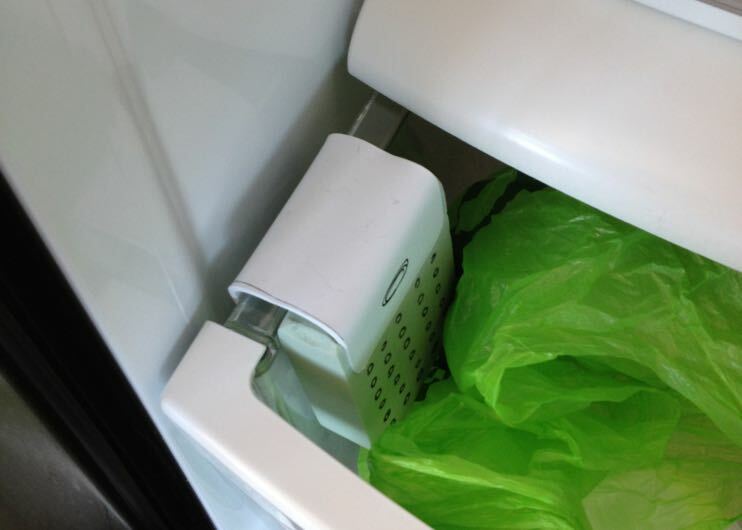 The final product attaches to the inside of your vegetable crisper drawer. It’s white color and slim profile help it blend in and look like it is part of the refrigerator. The perforation pattern is designed to let in ample air and tie it visually to the other products in the GreenSaver line. With this project I was asked to create a set of tools with distinct functions for keeping your kitchen and all of its appliances looking and functioning like new. Whether it’s the impossible-to-reach pulp at the bottom of your juicer or the gunk between the stove and counter, these tools will have you covered. In the early phase of the project, for inspiration we looked at existing home cleaning tools along with other specialized tools like those used in dentistry. These, along with an understanding of the various kitchen problem areas informed brainstorms around function, storage, and form. Testing took place throughout the design process of the tools from sketch models to machined prototypes. We brought prototypes to users’ homes to see how they would use them with their own kitchen and appliances and find the tools that were most universally effective. Moving between digital sketching, CAD, and 3D prints, I worked to refine the tools’ shape and proportions. It was import to strike the right balance between a size that would be comfortable to hold but small enough to get into tight spots. At the start of the project frankenstein models were made with everything from toothbrushes to toilet scrubbers. Some examples include using an oversized Sharpie and its cap, to test a concept where one function snaps onto another, or a folding travel toothbrush to make a transforming tool. As the concept began to solidify, models made from foam helped to test ergonomics and different methods of storage. In the later stages of the project, FDM prints gave us the ability to test it in wet and soapy environments as well as evaluate final form and surface quality. This all purpose brush is great for sink hardware, food processors and other tight spaces. The angled head and thumb divot lets you apply firm pressure while you scrub. The flat scraper helps remove baked-on messes, stubborn stickers and more. Anything you want to get underneath, this scraper will do the work. The chisel gets into grooves and nooks on toaster ovens, the line between your sink and counter and even that pesky refrigerator lining. The loop brush is perfect for juicer parts, and for cleaning around blender blades without getting your hands too close to the sharp edges.